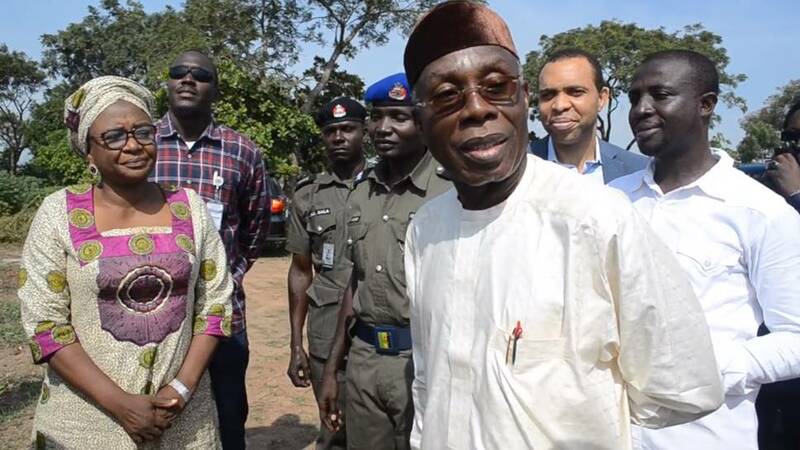 Nigeria’s Minister of Agriculture, Chief Audu Ogbe, on Thursday, October 26, 2017, made a major pronouncement in support of safe biotechnology in Nigeria, during a visit to one of the Bt. Cotton Multi-locational Field Trial (MFT) farms located within the premises of the National Biotechnology Development Agency (NABDA), Umar Musa Yar’adua Way, Lugbe, FCT Abuja; affirming that indeed ‘’there is no substitute to scientific research’’. The statement which the Minister made after listening to explanations from scientists and Researchers from the Institute of Agricultural Research (IAR) Zaria, NABDA and Monsanto who are jointly managing this field trial which is one of the 17 MFTs locations in Nigeria, represents a major Federal Government key policy position in support of Genetically Modified Organisms (GMO) in Nigeria. In an expression of satisfaction of what he saw and was told at the research centre, Ogbe said, ‘’We cannot change anything without serious work’’. When asked for his personal opinion on the project by Prof Lucy Ogbadu; DG NABDA, the minister replied by saying that; ‘I am so happy seeing this now because there has been large talk on Bt. Cotton risk and people’s yearning’’. He thanked the IAR, Monsanto and NABDA for all their efforts and promised that he will be more involved in the monitoring of developments with the trial project. Ogbe was told about how resistant materials are being assessed for adaptation to different ecologies of the country. Among those who gave explanations to the Minister was Prof. Onu, a Scientist from IAR Zaria who explained that recourse to biotechnology was necessary for the improvement of our local varieties which are vulnerable to insect infestation. He regretted that Nigeria has been witnessing a significant production drop in the cotton sector which used to be a major contributor to GDP and national growth in the past. He recalled that the sector used to be the greatest employer of labour more than any other sector in the country but ‘’for various reasons ranging from socio-economic to biotic and abiotic factors is now as good as dead’’. Onu stated that the biotic factors which has contributed to the unavailability of seeds that are resistant to the major vagaries affecting cotton production is the area that the field trials are trying to address. He pointed out that the main objective of the project is to carry out field trials to check: the field performance assessment; growth performance; reaction to pests, challenges and problems and their adaptability to various ecologies of Nigeria. After putting together sufficient data from these assessments, recommendations can then be made to the National Variety Release Committee, presenting the most suitable variety for release for commercial production and use in the cotton system in Nigeria, he concluded. In his contribution, the Principal Investigator, Dr. Sadiq, from IAR, explained that there are six seed varieties of cotton on the NABDA trial farm; four of which are supposed to contain some resistant material for resistance to certain insects, specifically the cotton Bollworm and the other two are the local varieties that do not contain resistant gene for Bollworms. 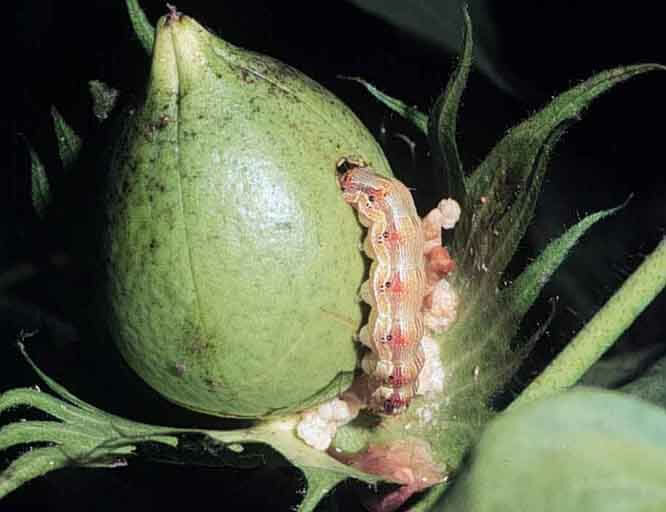 ‘’Bollworms’’, he noted are the insects that devastate cotton in the farm if proper care is not taken by the spraying of certain chemicals to deliver harvest. 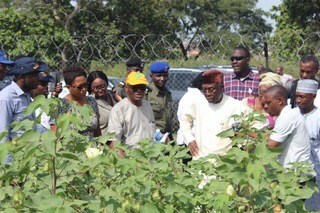 Dr. Sadiq also explained that the two varieties are planted side by side and that the two sets are exposed to two treatments; one set for controlled Bollworm and other insects and the second set; for uncontrolled Bollworm and control for other insects to assess the viability of these resistant materials in our Nigeria ecology. He asserted that despite the control, observations will show that the local variety looks haggard, due to insect infestations and dissipation of nutrients that was supposed to be transferred to the fruiting points leading to reduced size and in some cases outright dropping of balls which amounts to huge loses to the farmer and impacts very negatively on the national economy. Another significant difference in the varieties, he noted was that there were more sympodia i.e. fruitful branches which can give yield of about 80-120 balls per plant. This suggests the reason for their high adoption rate globally due to their high yield, which makes the transgenic i.e. modified varieties more prolific as compared to the local hybrid. He explained to the Minister that the attack of the insect on the local materials implies that the farmer needs to spray at two weeks interval for a reasonable harvest. He explained that this would mean that the farmer will have to use more chemicals which are more costly and unhealthy to the farmer, the crop and the environment as the chemical targets all insects; thus very high farming input. The truth is that the Bolgard, which is the transgenic variety, is resistant to the Lepidopteran insects. Therefore the hybrid cotton variety that has assumed resistance to insects would have reduced the amount of chemicals that would have been applied, thereby protecting the farmer, the farm and the environment and leads to reasonable harvest from the farm and facilitate industrialization towards a sustainable economy and development. Dr. Rose Gidado, Country Representative of Open Forum for Agricultural Biotechnology (OFAB) in her contribution emphasised on the cost and health benefits due to the reduction in the pesticide use. She stated that farmers were losing about 80-90% yield to insect infestation before the technology of modification of transgenic varieties. She maintained that science is a driver of change and there is no way you can move various sectors like; agriculture, health and economy forward without science. She applauded the Minister’s visit stating that ‘’The Minister has seen that Science is practical and evidence-based’’ she concluded. After these explanations, the Minister wanted to know whether these resistant materials are for short staples or long fibre. Prof. Onu again clarified this by stating that the long staples are more suitable for ecologies with longer rainy seasons which are typical of the Southern part of the country and cited the field trial at Abeokuta as one of locations for long staples. The Minster in his response thanked the Researchers for their efforts which he described as being in line especially with some of the interventions Nigeria is looking for now to cut down import and increase export. ‘’I am happy with what I have seen today because this is the issue. The farmers keep asking for the seeds, and the cotton growing is literally varnished. The textile industry is as good as dead in Nigeria and it is very disturbing. In fact the President is extremely concerned about this. If this can continue and result in the revival of the textile industry, then we have a major achievement. We appreciate what you are doing because the ministry alone cannot do so much. It is what is going on here that matters to really develop the agric-sector as Nigeria consumes more textile than any other. As we are slowly coming out of recession, there are still serious challenges ahead. The population is still galloping at 3.2%. So, the economy still need to perform at 6-7% to be able to talk about growth otherwise there is no growth. If we are heading to 200 million population in the next 3-4 years and 450 million by 2050, that is so scary. Whatever we are doing now is very little compared to what we need to do’’, he concluded. Prof. Lucy Ogbadu thanked the Minister for the visit and reassured him that the visit shall encourage the Scientists in their various research activities for the safe application of modern biotechnology in agricultural practice for growth and development in Nigeria.